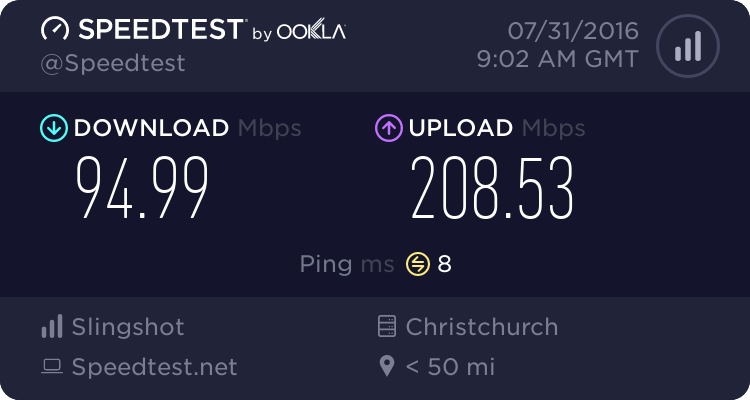 Downhillnz: The reason Chorus like to have Cat5e/6 cable rewired to a new Jackpoint is for a few reasons. The difference between having 10-20m of that old untwisted 2 pair and having cat6 is minimal. 200k downstream (I have compared with some installs for curiosity sake). As long as there are no multiples on the pair that he used to get to the dedicated jp. It would be fine. hmm, interesting that they are looking at bumping the speeds up. would that mean an increase for everyone? would i get an increase or is this the best i can get? I have installed a few connections with these kind of stats. The Errored Seconds aren't a good look. I don't know how they are going to work with DLM on this. The connection looks close enough for a profile jump, but whether DLM will let it stay on that profile will be something else. it has been installed for more than the 10 days if you look at the up time its been up for 21 days there. i hoped it would jump but it hasnt. suspect you might be on the boardline for 17a there.. your errored rates are pretty heavy looking. somethings displaying wrong there though, your errored seconds are far higher than your connected seconds? unless thats in mins. its much like my line, right at the spot where it could go any day, but DLM is a mystery! maybe post up the stats from telnet? as the GUI can sometimes misrepresent the data. Your attenuation is a little lower than 0dB? That's awkward. Because of all those ES and the fact the attenuation on the downstream is 0dB might mean he has a line fault. DLM wouldn't jump a profile for that reason. Jase2985: maybe post up the stats from telnet? as the GUI can sometimes misrepresent the data. its all lowercase supposedly. im just trying admin. no idea what else it could be. according to this thread telnet is locked down on my modem. pjamieson: The info I've been given internally is this is a Cable Terminal (CT). If there is no ETP after this then the Demark/ETP is the first jackpoint. Therefore the Splitter is installed at/behind the first Jackpoint. Yeah, in NZ the demarc is the first jack if theres no ETP in these really old buildings. However that means the line inside the ceiling is Chorus problem and could require upgrading if you complain about DSL sync/speed problems. Especially with untwisted wire right next to other sources of interference, I would say they might decide to replace that bell thing with a proper demarc. I question why they put in a splitter for Naked DSL... And what is the other phone cable connected to the phone line? With Naked DSL there should be a modem plugged in and nothing else at all. I would chalk that up to being his first naked install, but you would expect he should know about that already. Maybe he's new? EDIT: They also should eliminate the multiples, which are a really big issue for some lines. They may have done some of it already, or waiting for a project to rework everything. By the age of that terminal. They would be digging up more than likely lead joints. Not really worth the hassle when VDSL is just an interim to fibre anyway. Splitters are mandatory installed. What about if the next person to move in wants vdsl too. And wants a phone. Or if the OP wants a phone put on, someone would have to install a splitter regardless.